We know that Assisi is a favorite spot for tourists, but are overwhelmed today by the scores of tour buses, cars, and every possible vehicle that is packed in and about the city. The hoards of people disgorged by these vehicles (plus ourselves) form a solid mass of humanity that streams toward the center of a town dedicated to the memory of a gentle saint. Alas, the Pinecoteca Comunale, which is supposed to offer audio guided tours, is closed. So is the Officia Touristica. Undaunted, we soldier on, for even with all the confusion Assisi has an elegance about it, a sense that it is above all the stamping feet and the calls of tour guides who seek to gather together their flocks. We learn about the life of St. Chiara, the founder of the order of Poor Clares, and we see the gentle, ascetic face of the Saint who was so close to creation that he listened and spoke to the animals. So, all is well… until we reach our car and find a parking ticket! It is extraordinary, for no other car in the line of cars around, about, before and behind us has such a paper. Never mind, we tell ourselves stoutly, we will go to the commesario and ask what is amiss. But… disastro! When, after driving up and down crowded, narrow streets, we finally unearth the police station, we are told that the person in charge of traffic tickets cannot speak with us until four in the afternoon. It is now twelve o’clock. Defeated, we drive away to St. Maria degli Angeli… and here, in the cool, silent, empty vastness of the church find solace and peace. Here are works of art adorning walls and ceiling; stained glass windows filter light that falls on an impressionistic depiction of Madonna and child superbly crafted out of an olive tree. Olive trees are big here in Umbria. Signor Ettore, our host on the farm where we are staying, presses a fine olive oil from his groves. His farm in itself is interesting, having been in operation, he estimates, from the 1600’s, and Sig. Ettore tells us that in older days oxen were used to press the ripe fruit. Since olive oil at that stage will take on the scent of its surroundings, the oxen remained upstairs, yoked to the shaft that turned the great wheel in the room below. In this stone room, beamed with massive oak and walnut, the olive pulp was gathered into huge glazed earthenware urns. Olive crops depend on the weather, and weather can be capricious. Our host tells of a terrible year—l956—when a winter of snow, ice and frost caused the trees to explode. Olive trees are survivors, though, and eventually they regenerated, sending three or four shoots up from around the destroyed center. 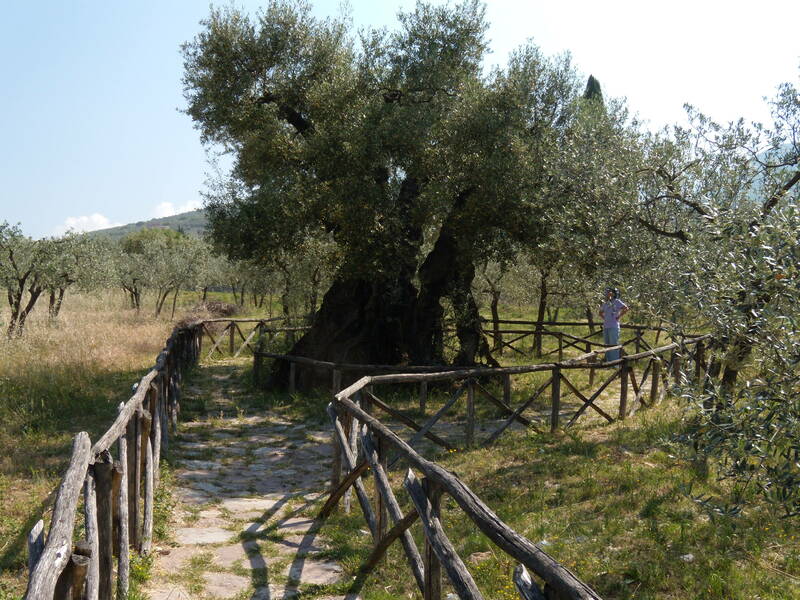 So it was with one of the oldest olive tree in Umbria. A mere shoot in 304 ACE, the tree is now 1,700 years old. When we went to see it the other day, we found it gnarled and thick with age, yet it was in full flower and ready to produce fruit. What stories it could tell, I remember thinking—what must it have seen and heard. Conquerors, saints, villains, ordinary folk and nobles all passed this tree by as it grew and matured. What great deeds, what pomp and panoply, what heartbreak or great joy flourished once under its gnarled branches and then faded away. Cataclysms, wars, festivals, change… the old tree saw it all, survived it all. And thinking of this, I suppose I may even forgive the misguided individual in Assisi who gave us the parking ticket. Trees 1700 years old or more. Wow! What stories could be told. What great adventures you’re having. Isn’t perspective a grand thing? Sorry about the ticket. Happy about the tree. Continue enjoying your (mis)adventures. I will indeed! Keep posted for more from the Ancients Abroad!! There are many bicycle tours… but best to check them out before you come this way. If you do, please visit Spello and have a sandwich in their beautiful garden restaurant…. buona fortuna, Jenny!